Like so many members of the world of theater and comedy, I started out as a waiter. I was a good waiter too, serving fancy veal scallopine to fancy people at a fancy Italian place just outside of slightly less fancy Chicago. But unlike many in the world of theater and comedy, I started a company, one that has thrived for over 20 years. It turns out that the skills that make you a good waiter come in pretty handy in being a successful entrepreneur. Tips were based on a percentage of our checks, so we had to sell, sell, sell. Every day, before the customers arrived, the chef would talk us through the most delicious and most expensive items available, the specials. The specials were the golden tickets, the Goonies’ map to One-Eyed Willie’s treasure, the Glengarry leads in Glengarry Glen Ross. The better we learned about them, the more convincingly we could sell them, the easier it was to turn a customer’s meal into a waiter’s meal ticket. Don’t get me wrong; the specials were great, as were the check-swelling wines and desserts. Our recommendations made for better meals. But they also make for bigger tips. We were the customers’ connection to the kitchen, their guide through the menu and their host for the evening. If they liked, trusted, and respected us, we got higher tips. Full stop. And everyone earned those things in a different way. My buddy Michael Clark was charmingly lascivious, explaining that a certain pastry was filled with a sweet, thick cream. A dude named Jordan was erudite and oddly pompous, but for him it worked. You’ve got to know your strengths and make them work for you. And you’ve got to be aware of your weaknesses and keep them 86ed. It’s the end of the night, and the guy at table 12 wants cappuccino. The little plastic thing that delivers milk to the steamer is broken. Go. The way I saw it, there were two options. Option one, you walk to Table 12 with a sad puppy dog face and admit failure. “Who wants cappuccino anyway when you can have a delicious cup of not-what-you-wanted?” Option two, you go all Ed Harris in Apollo 13 and figure out a solution involving a straw, two rubber bands and a ziplock bag. Failure is not an option. In the heat of the moment, every waiter will need help. You simply cannot be at two tables at the exact same time, and yet that’s exactly what they’re demanding. The great news is if you’ve got your fellow waiters’ backs, they’ll have yours. And of course if you stab someone’s back, you can be sure they’ll be sharpening a knife for yours. So have people’s backs. We also had a support staff of busboys which is how I started out. At the end of the night, you share the wealth. Not all of it, mind you, but enough that these guys feel appreciated and want to keep having your back in the future. Weirdly, I would get better tips when I solved a problem than when there were no problems at all. This was even true when I caused the problem! I never tried to throw the kitchen under the bus like some other waiters would, (see “Love Your Team”! ), but if I owned up to the mistake and fixed it quickly and cleanly, I was a hero. I’m pretty sure I’d have made even better tips if I created problems just to solve them. I never actually did this… but I still think it would work. People are impressed by and show appreciation for those who can identify and solve problems. When I had just one table, I had too much time on my hands. I got lazy and sloppy. But when I had too many tables? It was like a fight scene from Age of Ultron, except no Hulk or Iron Man, and way more emotional investment in the characters. 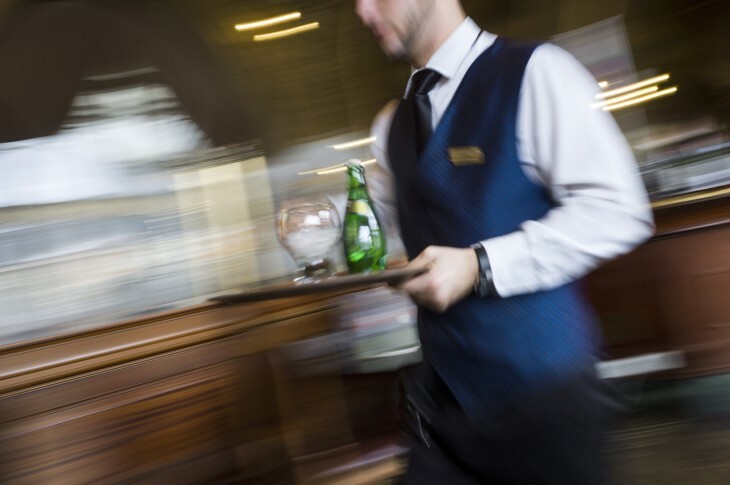 Some brains just kick into high gear when forced to focus on ten things at once, and good waiters are on that list. And of course, the more things you’re doing well, the more you make. I’m not saying all entrepreneurs have to do a stint as a waiter before they launch their startup. I’m just saying they should. If only so they remember to tip well when spending that VC money at San Francisco’s trendiest new restaurant. Read next: Win a Microsoft Surface 3 or a Chromebook Pixel!